The Mammalian Behaviour and Evolution Group (MBE) from the Institute of Integrative Biology was represented by four members (Paula Stockley, Holly Coombes, Callum Duffield and Stefan Fischer) at the Gardener’s Question Time Anniversary Garden Party in Ness Botanical Garden. The event saw more than 2000 guests visiting the garden and the live broadcasting of the BBC Radio 4 show. The whole day on Saturday 16th September was reserved for this massive event and the garden staff showed an immense effort to deal with all the visitors and exhibitors. The MBE group secured a table in one of the huge exhibition marquees next to other exhibitors such as the Wirral Wildlife Trust, RSBP, and the Wirral Barn Owl Trust. We showed visitors the diversity of small mammals occurring in the UK with small posters, video clips and, as the highlight, two small rodents to observe. We chose two very different species for visitors to observe: a harvest mouse and a bank vole. Harvest mice are the smallest mouse species and are listed as a Biodiversity Action Plan Species because of their scarcity and the required conservation actions to stop their population decline. Bank voles are a very common rodent species occurring throughout Europe. The harvest mouse was definitely the star of our exhibition and every visitor left with a big smile after finding the little mouse inside the well-structured enclosure. It was particularly nice to see how every person visiting our stand, old or young, woman or man, reacted to the little rodents and how everyone was immediately interested in their behaviour and ecology and asked more facts about rodents in general. We had very nice conversations about topics as diverse as the work of the MBE group, conservation and general behaviour of rodents as well as pest control measurements. I think it was an extremely productive and well received exhibition and visitors of the stand left with a smile because they saw cute rodents and learned more about small mammals in the UK. Moreover visitors will remember that the MBE group of the University of Liverpool is engaged in diverse research areas to better understand and ultimately better conserve mammals in the UK and around the world. Find out more about the Mammalian Behaviour and Evolution Group. 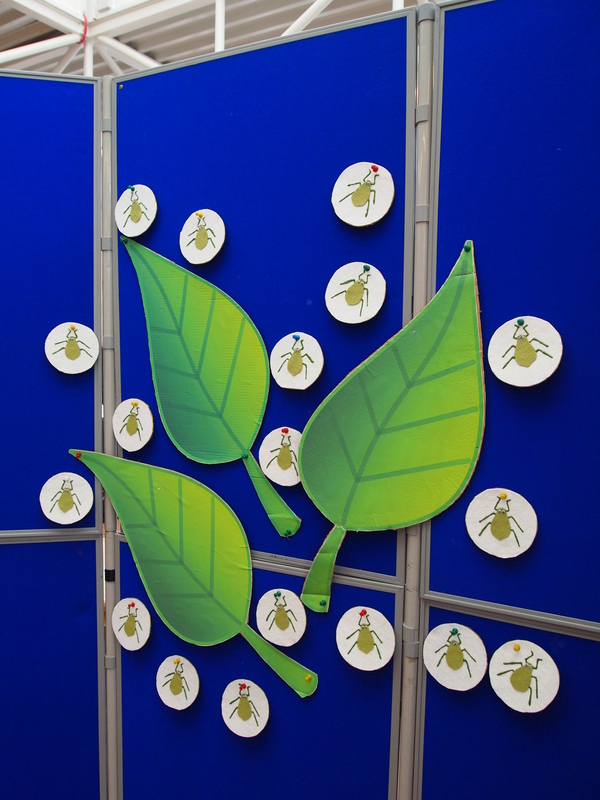 On May 16th the World Museum in Liverpool hosted its third Fascination of Plants Day (FoPD) in collaboration with scientists and educators from the University of Liverpool. The organisation of an indoor event is one of the few reasons to hope for a rainy day but sadly it was nice and sunny in Liverpool! Nevertheless about 500 visitors passed through the exhibition, each spending at least 20 minutes learning about many aspects of plant science. 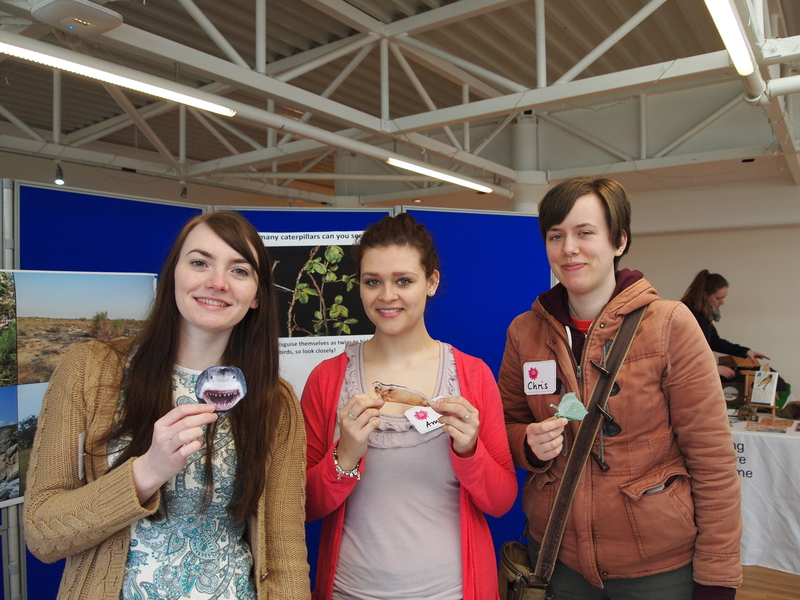 Everyone likes a free gift so the exhibit from Ness Botanic Gardens was very popular! 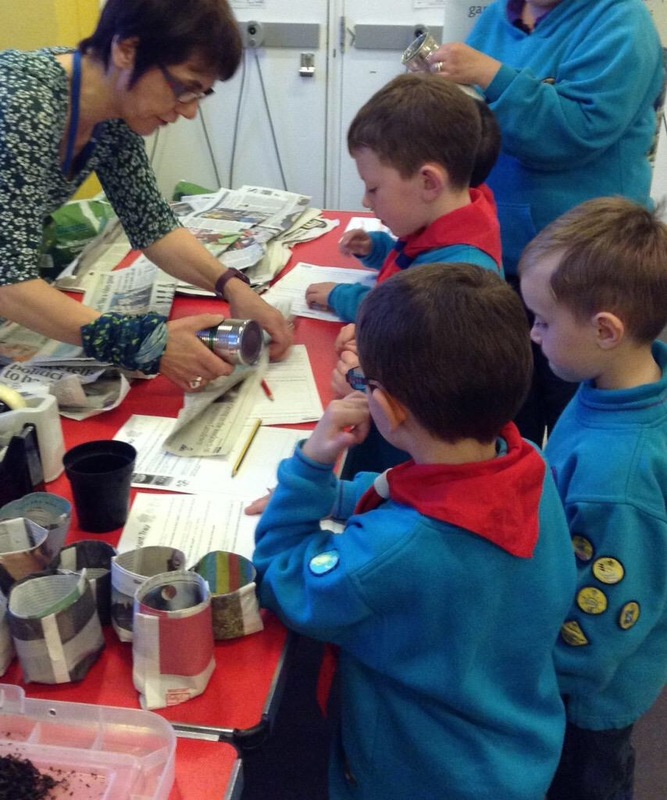 Rose Froud and Andrew Lambie showing visitors of all ages how to make pots out of newspaper and then helped them plant either sunflowers or runner beans! Dr Geraldine Reid from the Museums botany department set up a microscope where the visitors were challenged to try and find locally discovered new Diatom varieties. Elsewhere techniques of plant science ancient and modern collided as dried and mounted specimens from the botanical collections were situated alongside a DNA sequencer that University of Liverpool researchers had used to sequence the wheat genome. This machine has recently been donated to the museum for future exhibitions and formed the second-stage of an exhibit that allowed (mostly) kids to extract strawberry DNA and then ‘load’ it onto the sequencer! Rumours are unfounded that this is the start of octoploid Strawberry Genome Project…… The group from UoL was led by Dr Geraint Parry and Professor Anthony Hall, ably helped by members the Life Science Outreach team. Preparing to extract strawberry, ready for the sequencer! Overall it was extremely gratifying to see plenty of smiling faces leaving the exhibition clutching their DNA extractions and temporary plant pots!! Hopefully they’ll be back again next year! On March 14t h a group of DEEB students (Rebecca Jones, Amy Eacock, Bethany Levick, Sarah Trinder, Amanda Minter, Chris Corbin and Daria Pastok) attended Ness Science Fair as part of British Science Association Science Week at Ness Gardens on the Wirral. The event was a whole day event aimed towards family groups with children ranging from 4-12 years and we had a wide range of events covering a number of disciplines. 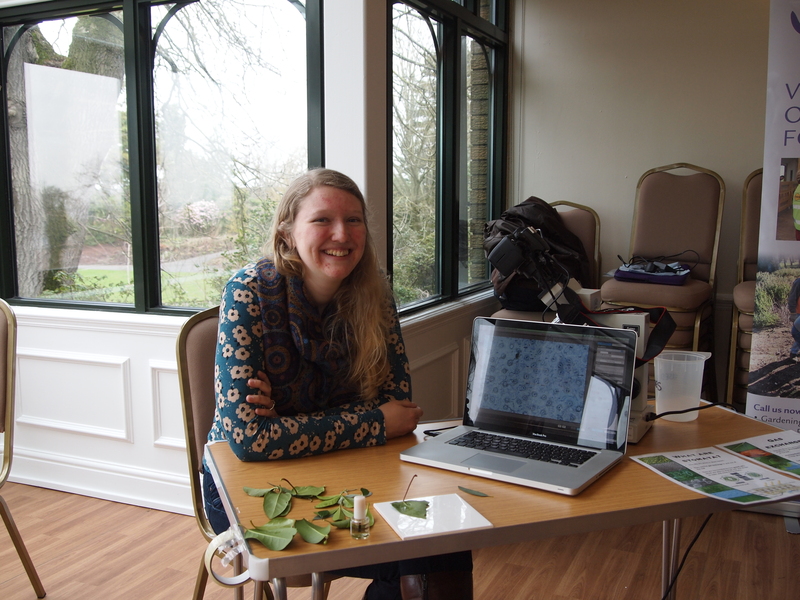 Sarah set up a microscope station to examine stomata on leaves which consisted of children painting nail varnish of different leaves. Our modellers Beth and Amanda set up a station examining population densities and carrying capacities. This consisted of children pinning aphids (with their resources) to different shaped leaves to examine how many aphids the leaves could support. Rebecca and Amy explored the world of camouflage whereby kids had to hunt for caterpillars on a background or camouflage different animals to their backgrounds. Chris ran a crafting event where children could create specimen jars and fill it with an animal of their choosing, some drew a T-Rex! Daria helped with all the events and was our resident photographer. We all had a great day at the event and were asked a lot of interesting questions by both children and adults. Over 300 people attended and we had great feedback on all the activities saying they were aimed well towards the children. Life Science students at Ness Gardens: On Saturday 14th March a group of undergraduates from the School of Life Sciences Undergraduate Outreach Group took part in the Family Science Discovery Fair at Ness Gardens. 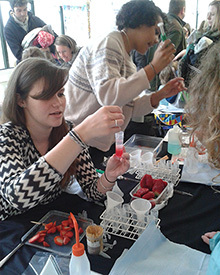 Around 300 visitors attended the event, getting stuck in with Strawberry DNA extractions and making DNA models from sweets with the students. Our undergraduate team were met by many intrigued members of the public from young children to adults. Genetics student Juhi Gupta who is president of the group said “This was a great opportunity for us as undergraduates to be involved in. We were honoured to represent the undergraduate student community from the School of Life Sciences”. About the Undergraduate Outreach Group: The Life Sciences Undergraduate Outreach Group was set up in May 2014 and consists of 30-40 School of Life Sciences Students from across our degree programs. 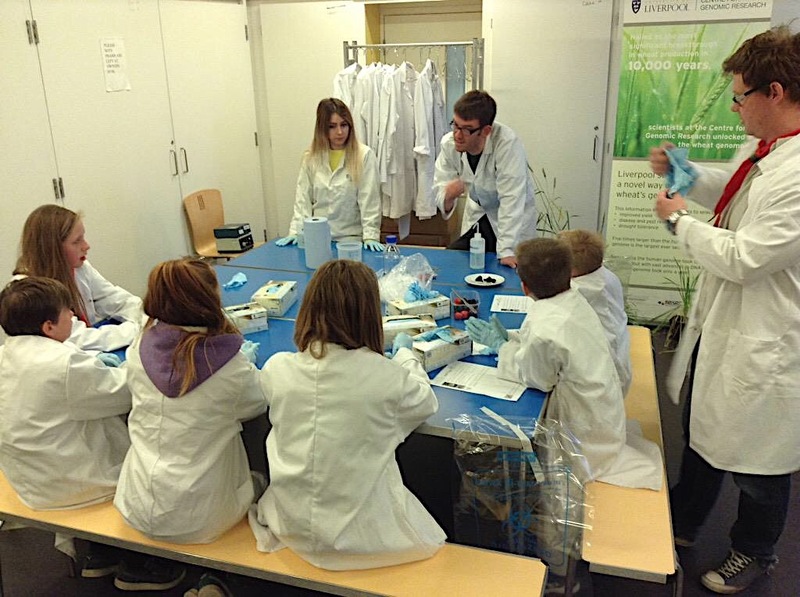 They aim to take their love of science out to the public, whether that’s school children or interested adults, and to inform and inspire them to want to know more about Biology. The group received a grant from The Friends of the University in Sept 2014 to develop activities of their own, but are also keen to get experience by helping with other people’s outreach activities. If you would like their help at your event please let Kate Hammond or Juhi know. Over the past year or so they have exhibited at the Big Bang Fair Northwest, the University Pop-up Shop and the St Helen’s Skills Show, and have also helped with activities run by academics from the School of Life Sciences, the Institute of Integrative Biology and the Institute of Global Health.